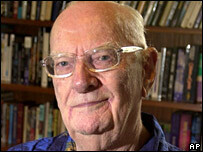 The imagination of the science fiction author Sir Arthur C Clarke bubbled over with ideas about the future of science, technology and human society. Here, BBC science and technology staff look at some that came true, and some that did not. 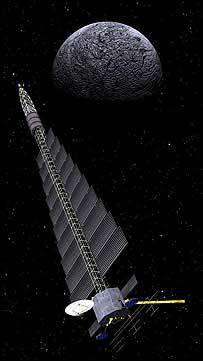 A space elevator consists of a ribbon of material strung between a spacecraft and an anchor on Earth. 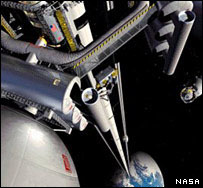 The tether would be used to transport material from Earth into space. Sir Arthur first talked about the concept in his 1979 novel The Fountains of Paradise, in which engineers construct a space elevator on top of a mountain peak on a fictional island. He embellished these concepts in his 1981 technical paper The Space Elevator: Thought Experiment, or Key to the Universe? Although he brought the concept of a space elevator to a wider audience, the idea was first conceived by Russian scientist Konstantin Tsiolkovsky in 1895. The idea may sound like it should remain in the realm of science fiction, but many take it seriously. Nasa has had a long-running space elevator research project, and recent developments with carbon nanotubes have raised the possibility of developing a tether strong enough to connect a ship to Earth - previously one of the key challenges. For the last three years there has even been a competition, run by the Elevator:2010 project, which awards prizes of $500,000 to help develop the technology. The millennium bug gripped governments and businesses as the countdown to the year 2000 began. The Y2K bug, as it was also known, referred to potential problems arising from older computer systems that could not recognise 2000 as the year coming after 1999. People were warned not to fly over the New Year, and were told that there could be potential problems with banking and even gas and electricity supplies. 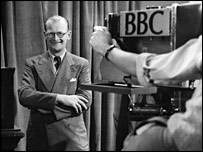 In interviews, Sir Arthur said he outlined what may have been "the first account, outside the technical literature, of the now-dreaded millennium bug, its cause and its cure." The prediction was made in a chapter of his 1990 novel The Ghost from the Grand Banks. In the end, the Y2K bug had little effect on businesses as the clocks struck midnight. This Clarke prediction not only came true, it did so with the name that he bestowed in his 1972 novel Rendezvous with Rama. The eponymous rendezvous occurs in 2131, when astronomers working with Project Spaceguard, Earth's defence system against asteroid strikes, detect an alien probe hurtling towards the Solar System. Alien probes may not be frequent visitors in reality, but asteroids and meteorites are; hence a 1992 Nasa investigation into how to monitor these visiting bodies and assess the threat they may pose. It was named the Spaceguard Survey. The primary aim of US policy now is to map 90% of Near Earth Objects (NEOs). Britain also has a national information service for NEOs, although lobby groups such as - you guessed it - Spaceguard UK would like the government to commit more resources to the issue. In The Hammer of God, Sir Arthur envisaged that a rogue asteroid could be deflected from its Earth-bound course by landing on it and fitting thrusters. 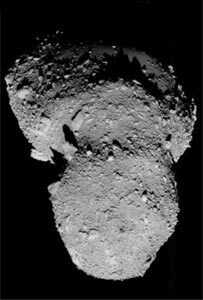 In 2005 the Japanese Hayabusa probe did land on asteroid Itokawa, though deploying thrusters and attempting a deflection is still science fiction. Arthur C Clarke was not the first to suggest using geostationary orbits - his ideas built on earlier work by Herman Potocnik and Konstantin Tsiolkovsky. His conceptual leap, outlined in a 1945 article in Wireless World magazine, was to propose using a set of satellites in geostationary orbit to form a global communications network. The key property of a satellite orbiting precisely 35,786 km (22,240 miles) above the equator is its speed, which mimics the rotation of the Earth below. So it remains always over the same place. The first satellite was placed into geostationary orbit in 1964, just 19 years after Sir Arthur's paper. Syncom 3 orbited above the Pacific Ocean and beamed pictures from the Tokyo Olympics to the US later that year - the first trans-Pacific TV transmission. Networks of satellites in this orbit now provide services including phone calls, data transmission, and TV signals for most of the world's inhabited regions. Meteorological and ground observation satellites also follow the path Sir Arthur mapped out, and the term Clarke Orbit is sometimes used to describe their trajectory. What he did not foresee was the development of the transistor and later the integrated circuit, which mean satellites are far smaller than the objects he sketched out, which would have used valve technology and needed regular maintenance. Prelude to Space was not only Arthur C Clarke's first published science fiction novel, it was the prelude to a career that produced a number of suggestions about how humankind might journey into space. The 1951 book envisaged bringing nuclear energy into use, powering a craft named Prometheus. Arguably the author was out-imagined by US planners in the early days of the Cold War, whose Project Orion concept involved craft propelled by detonating a series of nuclear bombs behind them. Orion did not get off the ground; but life eventually imitated Sir Arthur's art in the Soviet Union, which launched a number of satellites powered by nuclear reactors. Cosmos 954 crashed in Canada in 1978, with contamination of the surrounding area. Nasa revived the nuclear concept a few years ago with Project Prometheus, a research initiative that would have sent nuclear-powered probes out to explore the cosmos. Its most heralded component was the Jupiter Icy Moons Orbiter (Jimo), which would use its huge power source to zoom from one exciting Jovian satellite to the next looking for water and life. But Nasa's Prometheus has died; and there is little sign of any space agency taking the nuclear option further. In Richter 10, his 1990 collaboration with science fiction author Mike McQuay, Sir Arthur tells the story of an attempt to predict and prevent earthquakes. The plan is to "spot weld" the earth¿s tectonic plates at 50 strategic locations, stopping their movement and therefore stopping the catastrophic splits that cause earthquakes. The welding was to be done by detonating powerful nuclear bombs deep inside the Earth. The plan is initiated to prevent a huge quake splitting California from the North American mainland. At the moment this scenario remains almost completely in science fiction. Earthquake prediction is an inexact science with no standard, reproducible technique used by scientists. 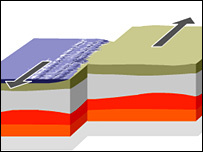 In addition, tectonic forces are huge ¿ able to build mountains, create deep ocean basins and tear continents apart. "Spot welding" an earthquake fault would probably have very little long term effect when pitted against these monstrous movements. In any case, the plan outlined in Richter 10 is foiled when a terrorist attack destroys the facility where the work is being carried out. Sir Arthur often explored the idea of backing up or transferring the human brain on to a computer. In his book 3001: The Final Odyssey he wrote of future beings: "As soon as their machines were better than their bodies, it was time to move. "First their brains, and then their thoughts alone, they transferred into shining new homes of metal and of gemstone." "In these they roamed the galaxy. They no longer built spaceships - they were spaceships"
It was an idea he thought would be useful for people wanting to pass their memories and personalities on at the end of their lives. "When their bodies begin to deteriorate you transfer their thoughts so their personalities would be immortal," he told the BBC in 2005. "Just save it on a CD-Rom and plug it in - simple!" Although scientists have not quite reached this stage yet, projects are starting to lay the foundations. For example Gordon Bell, a researcher at Microsoft, is working on a project called MyLifeBits which aims to digitally store "a lifetime's worth of articles, books, cards, CDs, letters, memos, papers, photos, pictures, presentations, home movies, videotaped lectures, and voice recordings"
The latest version of the project also allows him to capture phone calls, instant messenger transcripts, television, and radio to build up a virtual surrogate memory of his life. Arthur C Clarke's pre-occupation with interplanetary space travel led him to consider how humans could survive for the long periods needed to cross vast tracts of space. One of the answers he came up with, outlined in the story The Songs of Distant Earth, was cryogenic suspension. The plot sees the human race having to leave Earth in a convoy of spaceships as the Sun is about to explode. 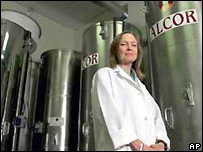 Currently, cryogenic preservation of living people is impossible, and in many countries it is illegal to attempt it. More than 150 people, mainly in the US, have been frozen in liquid nitrogen after their death. But even the companies running these projects admit that freezing cannot be reversed and there is no proof that it would preserve peoples' identities, even though there is evidence that brain structure can survive the process. In medicine, very cold conditions are used to store organs before transplantation and to store eggs and sperm, and as a way of removing warts.